It’s exciting to watch a publication being printed on the web press. Paper is fed from a continuous 2,000 lb. spindle of paper that is fed through what seem like two stories of mechanical gingerbread parts. Around and around it goes, till the publication is magically printed two-sided, folded and then spit out the other end at a rate of 10 pieces per second. In no time, 50,000 or even 100,000 copies are ready to be bound, trimmed, labeled sorted and bundled for distribution or mailing. I am reminded of a tour that I attended at the Chicago Sun Times while I was in middle school, many a moon ago. With the web press, the quality is not the same as most sheet-fed presses. Indeed, the web press offers great cost savings for newspapers, news magazines, recreation guides and direct mailers with large print runs. Yet, it is important to allow for some issues such as offsetting, where the ink, since it may not fully dry before folding, actually creates a slight impression onto another page. Another disadvantage is that the Web press can also slightly crease and crinkle pages during the very quick folding process. Nonetheless, these are small trade-offs for the benefits in cost-savings, especially for a quantity of more than 50,000 pieces. 1) A publication being printed on the high-speed web press. 2) Pallets of publications are shrink-wrapped for delivery. 3) A recreation guide coming off the press folded and ready for binding with the cover. 4) Huge rolls of paper for the web press. 5) A roll of paper on the web press. 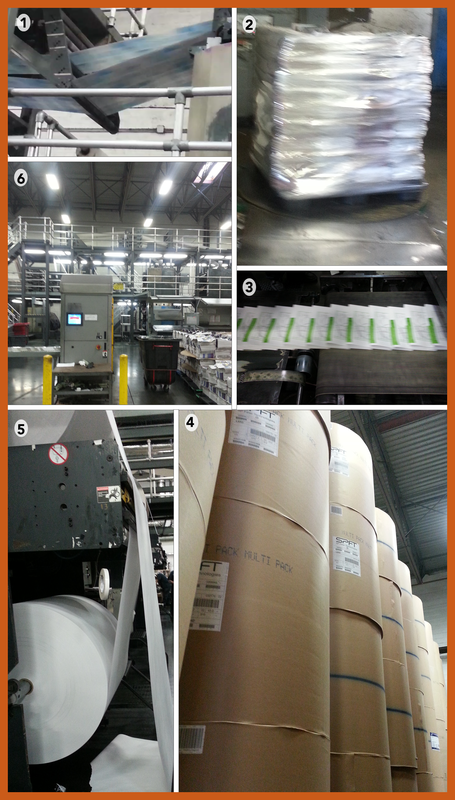 6) The web press machine nearly fills an entire warehouse. Shoot’n out the press we go. It’s a – high-speed world!